Julie has often suggested that the best things that have come into our life have come as a surprise. That happened when, as a nervous graduate student finishing my Ph.D. at Washington University in St. Louis, I was offered, out of the blue, it seemed, a post-doctoral fellowship in the History Department at Johns Hopkins University. Even more surprising, a year later, this son of the south, and a Protestant to boot, was offered a position teaching early American history at the University of Notre Dame. Even more surprising was when in 1995, the President of Notre Dame Father Edward Malloy, asked me to serve as Provost. It was something I could have never predicted, but it was a great privilege to serve in that position for almost a decade. When, in the fall of 2004, I was contacted about the Presidency of Wake Forest, it was another surprise. I had known about Wake, growing up in the Carolinas and having had several relatives graduate from Wake Forest. And I did remember, in junior high, watching Lennie Chapel and Billy Packer play against the University of South Carolina in basketball and Norm Snead in football. I had met Tom Hearn on one occasion, but actually knew surprisingly little about the University and how it was doing. Julie and I came to Winston-Salem for a confidential visit very early in January 2005. We left snowy South Bend and arrived comfortably in Winston-Salem, being met by a member of the search committee, Michele Gillespie, and her husband, Kevin Pittard. The next morning, Julie and I stepped out the front door of Graylyn and were greeted by blue sky, bright sun and temperatures that were about 70 degrees. No other sales pitches were needed about Winston-Salem as a place to live. What did we find? Julie and I have been richly blessed to call Wake Forest and Winston-Salem our home. We found tremendous warmth and hospitality. We were welcomed with open arms by trustees, alumni, faculty, staff and students. The whole community could not have been more accommodating. We have never regretted the decision for even a moment, although we were tested slightly when, in the spring of 2005 within months of our accepting the job, Chris Paul decided to leave Wake Forest, and what would have been a top-ten team, for the NBA. We found at Wake Forest a very strong foundation. There was something real, important, even magical here. That magic has to do with quality and rigorous education, combined with a personal attention, in the context of a viable community, and one in which values are genuinely upheld and students called to higher purpose. 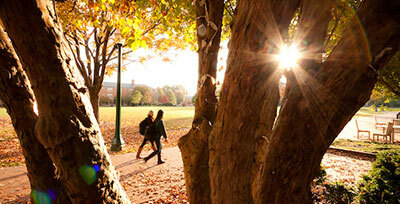 Wake Forest today is a university with considerable momentum. We have never been more attractive as a place for undergraduate education. We have grown in quality and diversity even as we have expanded the student body. Our national reach continues to grow. We have invested in first generation students with creation of the Magnolia Scholars program. We have clarified our identity as a collegiate university through a comprehensive strategic plan and campus master plan. We have joined two small and underfunded business schools into one school with a far more compelling vision and orientation. And we have aligned our Medical School and the North Carolina Baptist hospital so that together, as a single operating unit, we can face the ongoing headwinds in medical care, research and education. Over the course of the last 10 years, Wake Forest College and each of our professional schools has experienced significant academic advance. This comes in the form of interdisciplinary programs, national grant funding, publications, faculty awards, national rankings, bold decisions, student performance and donor-sponsored initiatives. One of our great strengths is the quality of our academic leaders, a team enriched this fall by the addition of three wonderful leaders: Michele Gillespie as Dean of the College, Suzanne Reynolds as Dean of the Wake Forest Law School, and Tim Pyatt as Dean of the Z. Smith Reynolds Library. In the undergraduate college, we have taken seriously our charge to create interdisciplinary academic programs. We have added nearly 20 interdisciplinary minors, and that means that the work of the faculty is spread widely across campus. 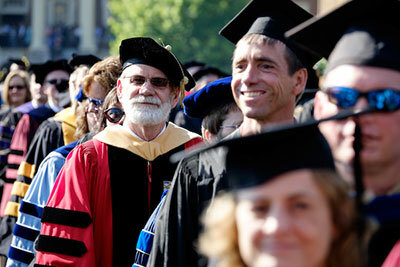 For example, the anthropology faculty contributes to 12 different interdisciplinary minors. We have also made mentored student research a priority through the work of the Undergraduate Research and Creative Activity Center (URECA). Now, more than 150 mentored students present projects annually, and more than $300,000 in research support is spread across all five divisions. URECA is also entirely supported by philanthropic dollars. Additionally, last year we won our first Beckman Award for science education, joining other winners, Yale, Duke and MIT. Many of our best academic efforts stand at the intersection of innovative teaching, scholarship and engagement. For example, we created the START gallery as a place where we combine teaching, learning and student engagement. We currently have the nation’s second-highest proportion of undergraduates studying abroad for credit. The work of the Humanities Institute encourages innovative programs in public humanities, narrative medicine and digital humanities. We also made a home for Pro Humanitate by the creating of the Pro Humanitate Institute and have incorporated that into our education offerings, including the Religion and Public Engagement concentration. Our students continue to be awarded prestigious honors like the Rhodes Scholarship, the British Marshall Scholarship, the Gates Cambridge Scholarship, the Fulbright Scholarship, the Truman Scholarship and the Goldwater Scholarship. And behind those achievements are our faculty who are consistently ranked among the top 15 schools in the nation for teaching. This year, we ranked 10th – our highest ever in this category. The Business School made a bold move merging the undergraduate school with the graduate school under one roof at Farrell Hall. In the last decade, we have seen the creation of the MA in management, a new program in analytics, as well as three research and curricular-reform centers: the Center for the Study of Capitalism, the Center for Leadership and Character, and the Center for Retail Innovation. Our business students continue to show the value of this education. Wake Forest students won the KPMG Global Case Competition two years in a row – to remain the only American university to win the international title. And for the past five consecutive years – and a total of eight of the last nine years – Wake Forest business students have ranked number one in the nation in CPA candidate exam passage rate. The Divinity School was named to a list of 25 “Seminaries That Change the World” and has grown in significant ways over the past decade. Just last year, the school was awarded a prestigious Lilly endowment to strengthen the pastoral and civic leadership of early career clergy. Students have the option to pursue interdisciplinary concentrations in wellbeing and religious leadership, education and sustainability. And in a community and state that contends with the issues of food scarcity, the Divinity School created the Food, Faith and Religious Leadership Initiative to equip students with the knowledge, skills and experience to lead transformative change. At the Graduate School, we explored how to make our educational delivery system suitable for distance learners by creating the online graduate program in counseling. We also started the graduate program in documentary film studies, and with it, launched Wrought Iron Productions. We added graduate programs in Interpreting and Translational Studies, Biomedical Studies and Sustainability. And thanks in part for the $6 million federal grant – the largest ever awarded to Wake Forest – our graduate students will be working with professors Steve Messier, Shannon Milhalko and Gary Miller to further study knee osteoarthritis and successful treatment measures in community-based settings. At the Law School, we seriously considered what engaging the community through legal education might look like. In response to that question, we created several law clinics that serve poor or low wealth clients. The elder law clinic, for example, just received a grant to help address the elder law needs of the LGBTQ community. The MicroTrade Clinic is helping cooperatives in Nicaragua sell their products to an international community. In addition, law faculty engage in some of the most important issues of our time. The United Nations commissioned Professor John Knox as Special Rapporteur on human rights and the environment, one of only two Americans who received the prestigious special rapporteur appointment. And while the law school engages the community, its graduates stay focused. The Wake Forest law class of 2015 led all law schools in North Carolina in bar passage rate for the state’s July 2015 bar exam. We have seen the work of individuals and programs transform the classroom and beyond. I think of the Character Project with Christian Miller and his team, Miles Silman’s ecological biology work, the renewal of the study of Classics through the innovative teach of Ted Gellar Goad and Michael Sloan, Dany Kim-Shapiro’s sickle cell research, Christina Soriano’s dance and Parkinson’s projects, and the Translational Science Center’s conception to marketing of Unbeetable Performance Drink. Have you had your beet juice today? The accomplishments and advancement in academics over the course of the past decade are exciting, and I look forward to how our past achievements will inspire our faculty and students moving forward. We have renewed this campus in substantial ways: building Byrum Hall – a new admissions and welcome center, constructing Farrell Hall – a new business school, and remodeling and moving ahead with a new home for the Department of Health and Exercise Science. A major remodeling of Worrell Hall is giving a new sense of identity and community to the Law School, and additional new space has been found for the Divinity School. We have reinforced campus culture with a new first-year residence, South Hall, the Barn, new eating venues like Zick’s, two Starbucks, Einstein’s Bagels, and a whole new eating commons on North Campus. We have added a three-year housing requirement and greatly enhanced the quantity and quality of upper-division residences with the conversion of 10 north campus apartments from faculty to student use and the construction of Dogwood and Magnolia Residence Halls. At long last, we have begun the remodeling of Reynolds Gym into what will become a state-of the-the-art wellbeing center. And we are tackling the overdue remodeling of residence halls built in the 1950s. Beginning with the construction of Deacon Tower, and the purchase of baseball and basketball arenas, we have developed a comprehensive athletic campus that now encompasses football, baseball, tennis and basketball. And there are plans in the works for a more comprehensive redevelopment of Deacon Village along Beaty Street. We have developed substantial efforts in making our campus sustainable and in providing serious leadership development though our Fellows program. We have reordered our efforts in development in building the infrastructure for the capital campaign, Wake Will, and in developing a state-of-the-art Communication and External Relations. The quality of our website, our magazine, our admissions materials and our crisis management team has become truly notable and nationally recognized. And we have developed an innovative approach to endowment management with the creation of Verger Capital Management. For all of this and more, I am deeply grateful to the entire Wake Forest community: the board of trustees, the faculty and staff, the students and alumni, and the colleagues in administration with which I am privileged to serve. WHY AND HOW HAS WAKE FOREST MADE PROGRESS? Why have we been able to make these advances? What have been key elements in allowing us to improve this place and to avoid shoals that could have diverted our course or damaged our vessel? First, I think Wake Forest has come to tell its story in a more national context. We have moved more into the mainstream of American higher education. In that stream, we are able to say why our distinct approach to education has compelling worth. Our distinctives, rightly articulated, address pressing needs in our culture: education that is demanding and supportive, in which adults actually are interested in individual young people. We have not shied away from speaking of character formation and of developing specific programs that connect who students are with what they might do professionally. We have worked consciously to make the campus more diverse and a place where students learn the art of conversation. In some areas we have been deeply traditional – as in suggesting the teacher-scholar ideal rather than moving pell mell to become a research university or in sustaining a tradition of being excellent without being pretentious. In many ways, we have become highly innovative. We have clarified the central purposes of a “collegiate university” and articulated that message to a much broader audience. Ten years ago, I found the mission and identity of the institution – who we are, where are we going – was assumed and not well articulated. Wake Forest knew that it was a good place, with a strong tradition, but its main orientation was to sustain a set of received traditions. There was a sense there was a certain Wake Forest magic, but that one had to experience it rather than try to describe it for those outside the Wake Forest family. Our communication efforts tended to be more reactive than pro-active. In short, we have clarified who we are and why a Wake Forest education can be vitally important for students in the early twenty-first century. A second reason for our momentum is that we have been willing to underscore our distinctives, not trying to play catch-up to someone else. Our goal has been a better Wake Forest. Jim Collins, in his short monograph of not-for-profit organizations, calls for them to establish “a pocket of greatness,” something we are deeply passionate about and can do better than others. It is plausible for Wake Forest to aim at things such as the following: to become the best at combining quality academic with robust support and personal attention; to become the premier face-to-face college residential experience; to become a place thoroughly diverse where students learn the art of conversation; to become the best at preparation for life after graduation. Another of these distinctives is to sustain and enhance a real community of learning and engagement in which people genuinely care for each other. That has great currency in contemporary America because it is in such short supply. We live in a culture that is increasingly impersonal, market-driven and achievement oriented. A recent study in the American Sociological Review notes that Americans today have a third fewer close friends and confidants than just two decades ago – a sign that people may be living lonelier, more isolated lives. One in four persons in the study had no close confidants at all, up from one in ten in 1985. A community that is both rigorous and caring can be an oasis in a parched culture. In speaking about our communication with the broader world, I would be remiss if I did not mention the amazing job done in recent years by the Communication and External Relations team in our Office of Advancement. Their goal is simple: to keep the world engaged with the story of Wake Forest. And to that end they have been exceptional on so many fronts. In admissions material, alumni engagement, the Wake Will campaign, news stories – and for so many offices and programs across campus – their work has been creative, inviting, even funny. I am grateful to the entire CER team led by Vice President Mark Petersen and by Brett Eaton, Hayes Henderson and Katie Neal. A third thing we have done together is to work some intractable issues and to make some tough choices. When I arrived, there were very serious morale problems among the faculty. There was a broad sense that academics were not central priorities, and I could understand their frustration when I learned how decisions were made about resources. The provost and the deans and the office of student affairs had little budgetary authority, no real command of budgetary resources. The issue of faculty salaries was the most pressing issue to be faced and the topic of almost every faculty meeting I attended. This became an early priority, and my first development goal was a $10 million Presidential Trust for Faculty Excellence. We simply had to restore the reality that, at Wake Forest, academics were at the center of life. I’m also pleased that we are well on our way to meeting our goal of creating 10 new Presidential Endowed Chairs, and because of Wake Will, we have raised $56 million in faculty support. We also worked to combine two small, underfunded business schools. Shortly after arriving, I had three strong business deans – from Dartmouth, University of Virginia and Notre Dame – come to consult about what to do with our two schools. Their clear recommendation was to put them together at some point but, they could not suggest a plan how that was to be done. Later, we decided to move forward by hiring a common dean and let the exact configuration of the two schools be determined over time. Steve Reinemund became Business Dean in 2008 and set a transformative course for management education at Wake Forest. It was transformative in creating a single business school, in developing a fresh business model, in beginning a new set of programs, in clarifying the key purposes of the school and in expanding our engagements in Charlotte. Another tough decision, and it was a key platform of our strategic plan, was to expand enrollment by 500 students. That enrollment growth began exactly at the time of the economic downturn, and I cannot tell you how important that was to give Wake Forest significant momentum as other universities, more endowment dependent, were cutting back sharply. In the words of Reid Morgan, using a NASCAR metaphor, we were able to pass others during a caution lap. The toughest challenge of all was the three-year process of putting our Medical School under common management with the North Carolina Baptist Hospital. That task took great patience and endurance, and I am deeply grateful to Wake Forest Trustees who shepherded this process along: Murray Greason, Marvin Gentry, the late Graham Denton, Don Flow, Donna Boswell, and of course, our own Reid Morgan. While speaking of difficult issues, I did want to address the substantial challenge the University now faces in making this the kind of inclusive campus in which everyone feels they can call their own. In the last decade, we have greatly diversified the student body, we have invested in support services for under-represented students—in multicultural affairs; in religious life, including for Muslim and Jewish students; and to support the LGBTQ community. We have increased substantially the number of Pell Grant eligible students. We have made large investments in diversity in unexpected places: the business school, where our new MA program is probably the most diverse in higher education. But we are on a journey, learning along the way as we attempt to make this a genuinely inclusive campus. Last year was a time of great conflict and great promise as we took a close look at our campus climate. Concerns about inequitable policing practices and the differential experiences of international students and students of color led us to offer a Deliberative Dialogue on Community last fall. Other groups also put forward recommendations and even demands for change. Those powerful aspirations led to the creation of a set of Action Teams, each comprised of students, faculty and staff, that sifted through all of those ideas and came up with strategic directions to pursue, many already accomplished. We have worked, and will continue to work, on issues affecting the LGBTQ community, on policing practices, on enhanced pre-school and orientation sessions and on curricular diversity. A new website has been established to take note of what is being done: Community in Progress. But we are certainly not done. I invite you to consider how you can be a part of the many ongoing initiatives we have to help Wake Forest live out its commitment to being a diverse, inclusive and equitable university for all—students, faculty and staff alike. I am deeply grateful to so many students, faculty, and staff who have worked on these important issues. In particular, I would like to recognize the efforts of Barbee Oakes, our Chief Diversity Officer, Vice President Penny Rue, Vice Provost Lynn Sutton, Dean of Students Adam Goldstein, Professor Melissa Harris-Perry and Provost Rogan Kersh. John Lombardi, the former President of the University of Florida, once noted that “absent a strong drive for change, most institutions stay more or less the way they are: stable, competitive at their level, but unlikely to move dramatically without significant and unusual impetus.” I think we at Wake Forest have championed a set of new ventures during these years, opportunities that have brought new life and energy to the organization. We have seen a whole raft of new ventures prosper on this campus. Under the leadership of Martha Allman, Wake Forest became test optional. Andy Chan developed the Office of Personal and Career Development, likely the finest program in college to career transition in the country. Nate French has been a great leader for our Magnolia Scholars Program and our ability to attract and nurture first-generation students. Maria Henson, a Pulitzer-Prize winning journalist, returned to Wake Forest and has transformed the Wake Forest Magazine. Mary Pugel and Mary Beth Wallace launched the Wake Forest Fellows program, engaging some of our finest graduates in a year of leadership development and service to alma mater. Lynn Sutton revitalized Reynolds Library, creating a model of service, engagement and downright fun. Dedee Johnston has been a wonderful catalyst for sustainability all across this campus. Andrea Ellis has given shape and momentum to our Professional Development Center, which offers an array or programs in organization and leadership development. Angela Mazaris, the founding Director of our LGBTQ Center, has been a firm advocate and creative leader. Led by Malika Roman Isler, our cross-campus initiative in wellbeing, Thrive, promises to strengthen the overall wellbeing of this campus as individuals and as a community. Using our splendid new facilities in Charlotte, Todd Johnson has built an impressive array of programs for young professionals, and, this past summer, for talented high school students. Allison Perkins has done a marvelous job of developing the assets of Reynolda House, and in her new role as Associate Provost, can integrate the Reynolda Gardens into a more coherent vision of historic Reynolda. Building on a wonderful tradition in intercollegiate debate, Jarrod Atchison has led our teams to national championships in all three divisions. A key in all of these developments has been supporting the dreams of innovative leaders. There is another important “middle way” that we have pursued. In our increasingly polarized culture, we have attempted to set a path that respects progressive as well as conservative values. On the one hand, we have made progress in diversity and inclusion, in expanding our financial aid for students with need. And we have many programs and projects that allow liberal members of the community to express their convictions. On the other, we have spoken openly about character, vocation, faith and purpose. In doing so, we have been true to ourselves – and we have, in large measure, sustained the loyalty of conservatives and progressives – on our board, among our alumni, among our faculty and staff, among our parents and students. I think we have been able to strike a balance in keeping true to who we are as an institution and with the goal of becoming an ever-better community in which conversation thrives. At a time when many are saying that traditional colleges are in trouble, Wake Forest has never been in a stronger position. Student interest has never been more robust, and we have the opportunity to expand that level of interest. We have a stable foundation on which to build. Our level of ambition for this place is high. We have a strong, energetic and collaborative team that can take on big goals and projects. 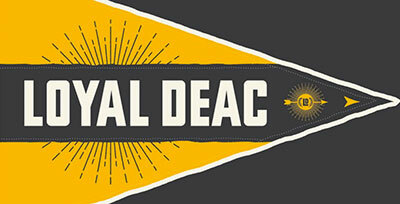 We have great deans in place who can advance their respective schools. We have a great faculty deeply committed to this place and to their students. As a community, we have developed a common sense of who we are, our core identity as a collegiate university. We are not casting about for our identity. We have built a modern development and communications team that is poised to raise support at unprecedented levels in coming years. I am grateful, indeed, that our Wake Will Campaign has already raised more than $520 million – two years ahead of schedule. We are thinking much more expansively about Wake Forest and our potential to expand in Charlotte, and in other places such as Washington DC, Silicon Valley and in international locations. We have done much to renew our campus, rebuilding our north campus from Farrell Hall around to Dogwood and Magnolia. Through tremendously generous support, we are making our athletic facilities competitive, and we have begun to take on the renewal of facilities built in the 1950s. We have become much more disciplined financially at the same time we are, for the first time, trying to build new streams of income from new non-traditional programs. In the next year, it is likely that we will launch a College of Professional Studies, which will offer quality programs, many of them in Charlotte, and online to non-traditional students. The goal is to build viable programs that serve a selective audience – and do it in a way that brings some revenue back to this campus to support our core mission. So, there is a lot that says: this is our time, a distinct moment to think big, to move forward, to become ever more innovative even as we support many educational values that are deeply traditional. But this is no time to rest on our laurels. I am convinced that we need to be hungrier, less content, more innovative than ever, more ready to call out mediocrity. We have not arrived by any means. We need to stay nervous and drive innovation. Why is this? We are playing in the big leagues without big-league support. We have a rare and in some ways untested identity: the collegiate university. We are not a research university pure and simple. We are not a liberal arts college. We are still in the transition between a largely regional institution to a national one, and in many American communities, with great schools and smart students, we are still largely unknown. We have become well known in certain markets, but are quite unknown in others. Our professional schools generally are not top 25, an aspiration that we should most definitely own. We are ambivalent institution – innovative in some sectors, very conventional in others. This is a campus that owns Farrell Hall but also Reynolds Gym, Salem Hall and Scales Fine Art Center – buildings that seriously need to be refreshed. And in some ways those buildings are a metaphor of where we are. In some sectors we are hungry to advance, in others deeply satisfied and resistant to change. We also must become more efficient and work to reduce the rate of tuition increases. The cost of going to Wake Forest, almost $65,000 annually, is prohibitive for a majority of American families and is an issue we cannot ignore. Increasingly, we will have to innovate and invest by reallocation, developing new programs and curtailing programs that are less compelling. This is difficult to do in an academic community, but it is essential that we balance innovation and financial discipline. I want to add a word about one specific initiative on our horizon. With the approval of the Board of Trustees, the University is exploring the creation of a set of undergraduate programs in Biomedical Science and Engineering to be located in Innovation Quarter in a building that is adjoined to the new home of the Wake Forest University School of Medicine. I am deeply grateful to all the faculty and staff who have been working tirelessly over the last six months on these matters, particularly Professor Rebecca Alexander, who is coordinating faculty efforts to design these programs, and Emily Neese, Associate Vice President for Strategy and Operations, who is coordinating issues of building design and so many other issues related to a potential new campus for undergraduate students. I am also grateful to John McConnell, CEO of the Wake Forest Baptist Medical Center, and Edward Abraham, Dean of the Medical School, who have been such creative and supportive partners in these efforts. There are at least three strategic reasons why we have chosen to pursue this rare opportunity. 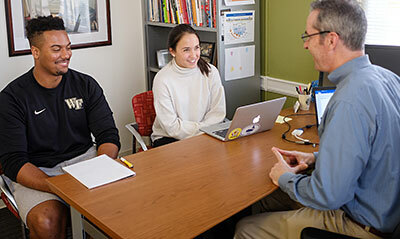 This set of programs offers Wake Forest undergraduates the opportunity to focus on biomedical science and technology – the most cutting edge and dynamic field of study in contemporary society. When we hear about the skills and knowledge gap in our society today, these fields are where the need is greatest. This move will also enable Wake Forest to attract a range of outstanding STEM students who have historically not applied to Wake Forest. Secondly, these programs will, for the first time, bring the Reynolda Campus and the Medical School into a durable, authentic programmatic collaboration. We have the opportunity to leverage the tremendous resources in our outstanding, highly selective Medical School on behalf of our undergraduates. We will have much closer collaboration – and physical proximity of faculty – so that other innovative programs in STEM teaching and research are likely to be generated. A final strategic reason for these programs is that, because of very significant tax credits available for the repurposing of these buildings, we can build gleaming new laboratories and classrooms at almost half the cost of building new structures. There is much to be done in the design and approval of these new programs, but I am delighted that we are working together to building these innovative programs. Moving undergraduate programs into Innovation Quarter is the most significant initiative we are undertaking. But there are many other important challenges ahead. What I look forward to in coming years are the new ideas, the fresh approaches, the improved quality that will be generated throughout this community. It is this spirit of ongoing innovation that I find inspiring about Wake Forest. To that end, let me encourage all of us, faculty, staff, and students alike, to bring an innovative mindset to our endeavors. I trust that this spirit, which I see alive all around Wake Forest, can become an ever rising tide. It involves a firm commitment—an insistence—that this place become better. Now, how should we all approach the future? Let me suggest four concepts. Our approach to the future means a relentless search for talent to bring the most able and committed people to Wake Forest in every sector of the university. Our mission should always be to find that kind of talent – hiring people better than ourselves. We need people who can dream and imagine, have a fierce ambition to make things better, enjoy the trust of one’s colleagues and have the rare instinct of how you build coalitions and support to move things forward. We need to inject more talent into the veins of this organization – talent of the right kind, committed to the mission, not just themselves, but talent nonetheless. And we need to recognize talent when it is here, reward and nurture it. It also means that we must engage in in vigorous self-examination and to encourage honest self-assessment. Would that we would reward colleagues for admitting weakness rather than always claiming strength. Ed Berger, who taught math at Williams, based ten percent of a grade on quality of failing. You learn by making mistakes, by admitting weakness – which then you have power to correct. We need to be able to smell stale air, to be honest about mediocrity and to change for the better. We also need the courage to benchmark what we do against the external environment in higher education. If we are just internally focused, looking at our own progress, we may be quite content. What we may not realize is that our neighboring institution has gone twice as far; or answered the same problem with a more creative solution. At a place like Wake Forest, where, as a collegiate university, we live in a certain middle ground and where repeatedly our reach seems to exceed our financial grasp, I do think the path of innovation, of being opportunity conscious, should be our watchword for the future. As we look ahead, I ask you to join me in scanning the horizon for fresh ways to fulfill the compelling mission that we share. Then, brick by brick, plank by plank, let’s build a Wake Forest that, ten years from now, will be better, far better, than it is today.